It's Morphin' Time in Gotham City! 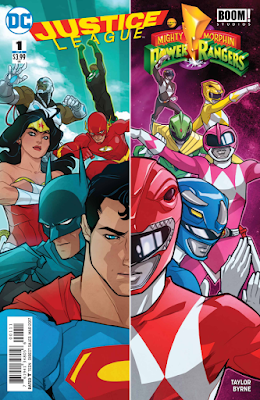 The story seems like a perfect set up to a comic where the JL and the MMPR team up. The reason they meet doesn’t feel forced at all. The comic comes from a collaboration of DC Comics and Boom! Studios who publish the current MMPR title and this story seems to take place sometime in that run. 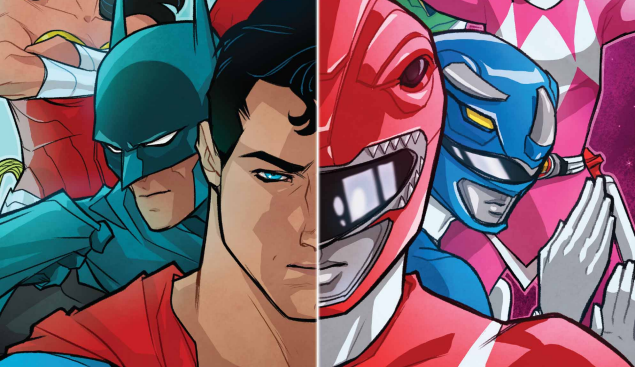 The art is consistent with it and it’s the same team of Jason, Kimberly, Billy, Zack, Trini, and Tommy. The JL team and their look is consistent with the current look of the DC Rebirth Universe where their costumes are from that continuity and looks to take place somewhere later in the current JL run. It was actually a little concern of mine to see if this was in continuity or not with either of the titles but thankfully it’s not. To me, when a story isn’t in current continuity, it doesn’t matter as much to me. Lord Zedd is the big bad in this story, which is pretty perfect as well because he’s a true formidable foe. It’ll definitely take a couple teams to take him down from wreaking havoc on Gotham City. Now, this is a setup issue so we get some information that a lot of people may already know, mainly introducing members of both teams. That’s definitely okay though, just in case people are new to these characters, that’s there for them. That aside, it’s a really fun issue. I love the art in the issue but sometimes it can be a tad off at time, mostly in the faces. Overall though, it’s a beautiful looking issue. It does look more in line with the art of Boom’s MMPR run, which makes total sense. I would want it that way because the art for the Rangers in that is amazing. The splash pages of the team always look epic and this issue isn’t an exception. This issue does focus more on the Rangers than the League. Though, the art we see of them is really good, we don’t get any cool splashes for the team, like with the Rangers. 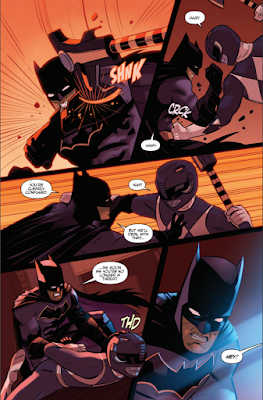 I’m hoping that we get more awesome action shots for the League in the next issue. This issue was a whole lotta fun, as a League/Ranger comic should be. The art is awesome, the story is fun, make sense and I couldn’t ask for a better reason for these teams to even meet. Even if you’re not a Rangers fan or even a League fan, there’s something here for many to have fun with.